Instructions: Prepare a card base out of Red cardstock 5 1/8 x 7 1/8". Cut a piece of white cardstock 5 x 7 and layer on top of the red. Using red cardstock, cut one of the Eyelet Lace Frames out and adhere to card. Cut one of the Eyelet Ovals out, add foam dots to the back and adhere to card. Add Gold Nuvo Crystal drops around as shown and set aside to dry. Stamp the pinecones and leaves on white card stock with Olive ink, color in with the Leaf Green and cut out with the matching dies. Shade with the Emerald green, using the Flower Shaping Kit, shape and adhere to the card. 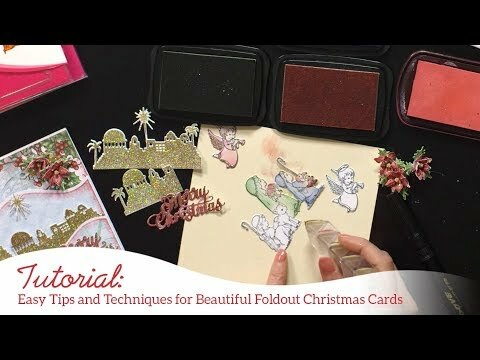 Stamp the Poinsettia on white card stock with the Red Geranium, color in with the Carnation Red, cut out with the matching die, shade around the edges with the Vermillion ink. Shape using the deluxe shaping tool kit. Add the stamens in the center and adhere to card. Locate and cut out the sentiment from the paper collection, punch the 4 corners and add foam dots to the back, adhere to card. To finish the card, add glitter to the pinecone, leaves and flowers.